Anna Quindlen is an American writer who ought to be much better known in this country. Her last novel, STILL LIFE WITH BREADCRUMBS, is very good indeed and I will be posting a review I wrote of it from my own website very soon. This book is the last novel I read and it impressed me hugely, moved me and made me realise how very restful it is to read a book that is a) beautifully written b) quite devoid of stylistic tricks or special effects c) quite small and limited in its scale while encompassing so many emotions and d) so much in tune with the normal run of the daily life of ordinary people. We exist in families. We have houses. Those houses are in communities, large and small. We live in the city or the country or a small town, but wherever we come from, what we remember of the place where we were children is in our DNA. For me, for example. Jerusalem is imprinted in my mind like nowhere else, even though I stopped living there when I was five. The eponymous Miller's Valley is home to the Miller family which has been there for generations. Now, it's about to be flooded in a government plan to develop the area. The inhabitants will be compensated and moved to higher ground. Natural floods do occur in Miller's Valley and our narrator, Mimi, has lived through quite devastating ones. She tells us about her life. Her parents, her brothers, (one who returned from Vietnam a changed person) her best friend, LaRhonda, her aunt Ruth, her mother's sister, who lives in a house on the Miller property and is severely agoraphobic. We meet her teacher. We learn to find our way round the streets of the town. We follow Mimi from childhood, through her teenage years and on to college and a career. Her love life, her disappointments, her triumphs: Quindlen brings them so vividly to life that you feel you are yourself, as a reader, inhabiting the town, sharing in its doings and privileged to be the confidante of such a careful, kind and sympathetic narrator. I defy anyone not to fall in love with Mimi. 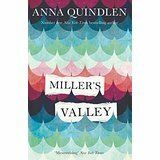 At the end of the book the valley is indeed under water and we knew this was going to happen from the first page, but Quindlen has put in a last-minute surprise that leaves the reader stunned and looking back at everything they've learned so far with entirely different eyes. This is a beautiful novel and if it's not on the Bailey's Prize shortlist next year, I will be very disappointed. I haven't been able to stop thinking about it. Born in Indonesia of French parents, and brought up in France and Australia, Sophie Masson is the award-winning and internationally-published author of over 60 books for children, young adults and adults. Her latest young adult novel is Hunter's Moon, (Random House Australia) while her latest adult novel is Trinity: The False Prince, (Momentum.) Sophie is also a founding partner and co-director of Christmas Press, a boutique publishing house producing acclaimed children's picture-books and fiction. She holds a BA and M.Litt from the University of New England in Australia and is currently undertaking a PHD in Creative Practice at the same university. She is on the Boards of the Australian Society of Authors, the New England Writers' Centre and the Small Press Network. She has also served on the Literature Board of the Australia Council and the Book Industry Collaborative Council. Writing about nice, ‘ordinary’ people, in a way that will make readers want to keep turning the pages, is not easy. And writing about nice people made tentative and ineffectual by life’s defeats and challenges—and other people’s attitudes and expectations--is harder still. In many ways, it’s so much simpler to write flamboyant, selfish, silly or psychopathic characters: those extreme personality traits can be very useful characterisation shortcuts. 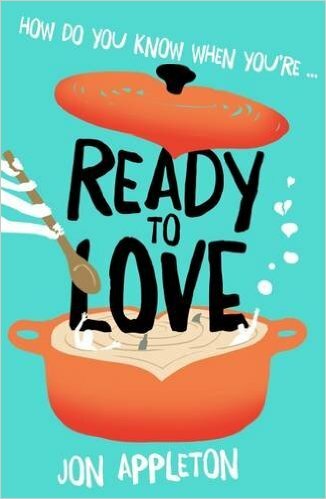 So it’s a real achievement when a writer not only pulls off the difficult task, but does it with keen observation and generous wit, as Jon Appleton does in his debut novel, Ready to Love. As its title indicates, Ready to Love can broadly be described as a romantic comedy. Set in contemporary London, it’s centred around two main characters: Minna, who’s just ended a relationship with self-absorbed Julian, latest in a short line of unsatisfactory lovers; and Jeff, still hurting from the breakup with his equally self-absorbed wife Sarah a year ago. Neither Minna nor Jeff have been ‘high-flyers’ or ‘movers or shakers’ in the world of work anymore than they have been marked successes in their love lives, but they are good people who try to do the best they can by their colleagues and families and friends. Unfortunately, that can lead to them being patronised or even bullied by stronger personalities who think that they know better than Minna or Jeff what each of them are like or should do. The reader hopes of course that these two nice yet rather bruised and tentative—but never pathetic or unsympathetic-- people will eventually find the beginnings of happiness with each other once they realise that they are, indeed, ‘ready for love’, but it’s not just that, pleasant as it is, which keeps you absorbed in the novel. In an interview I conducted recently with Jon Appleton, he said that, Ready to Love is about the way we see ourselves and how we think other people see us, and the different kinds of attachments we form to those around us: family, friends, lovers, colleagues. And that is what makes the book so satisfying: too often, in romantic comedies, the focus is just on the search for love, but in this novel, the author does not forget the other large chunks of life, including the everyday world of work, which in real life takes up so much of people’s time, thoughts, and emotional energy. And the great cast of secondary characters, from all the different areas of Minna’s and Jeff’s lives, are deftly sketched in with telling detail. Jon also mentioned in the interview how important the novel’s London setting was to him, as the idea for it came out of a feeling of homesickness when he was living away from his London home for a year, but was developed fully later, when he was back. That development is evident in the novel, where the city background of these contemporary thirty-something professionals is painted with a light yet vivid touch, adding to the enjoyment of a novel that is both most entertaining and elegantly written. I came home one day from a trip to London to find a huge parcel waiting for me. It was this book: THE QUIET MUSIC OF GENTLY FALLING SNOW, written and illustrated by Jackie Morris, the very well known artist and writer of many wondrous books for children. The volume measures 37cms by 28cms. It's a a picture book for adults and I believe it would be good if there were more of these published, because we don't stop appreciating beauty when we leave our childhood behind. It's published by Welsh publisher, Graffeg, and they've done Morris proud. It costs £25 which seems to me to be excellent value. The book has an usual genesis. Since the year 2000, a charity called HELP FOR MUSICIANS UK has commissioned Jackie Morris to create a Christmas card for them. All of the cards are reproduced at the back of the book. This book knits and crafts those cards together into a single volume made up of many stories, weaving their threads (a favourite word of Morris's) into a beautiful tale (or tales) of loss and love and music. Because of the origin of the cards, the stories are about music; its creation, its destruction; its fragilities and strengths. Morris's love of music comes over in every story and there's a sort of counterpoint that runs through them. Morris has added pictures as well as stories. The creatures who inhabit these tales are ones we know she loves from her other books: bears, swans, hares and birds. The ingredients of fairy tales (towers, snow, forests, ships, trees) fill the narrative, skilfully woven into something singular and strange. Reading the book is very much like listening to different songs, different tunes drifting into your consciousness.They're described as lullabies for grown ups and that's very accurate. The narratives are loose and flowing. The characters appear and reappear and disappear and the animals change and become creatures different from the ones we first thought we'd met. The rhythm of the prose sets out to lull the reader and succeeds in doing exactly this. The instruments, depicted many times in the wonderful paintings on every page, are fiddles, flutes, lutes and drums. Anyone interested in identifying them can spend many happy hours looking at each double page spread and seeing what can be found in each one. The pear tree in the 'partridge in a pear tree' illustration is also the Singing Ringing Tree which goes on to create forests which it takes seven weeks to walk through. That seven is of course another link with the world of the fairy tales. This book would make a most beautiful Christmas present for any adult who enjoys fairytales, music, and above all, rich and gloriously coloured illustrations which depict people, creatures and places which are buried in our imagination and which, thanks to Morris, we can pretend are real. She has moved the fantastical from the realm of our dreams and into the light of our real world.